Music and sport activities are positive for all children's wellbeing. Children who are involved in sports get higher school grades, have an increased sense of self-worth, and are more likely to complete high school than children who are not involved in sport. Children involved in sports are also generally healthier due to their increased activity, and have stronger social networks than children who do not participate in sport. Children involved in music activities (such as learning a musical instrument) are often better adjusted, with increased academic performance, ability to think creatively, emotional understanding, and emotional expression. Children involved in music typically have better memory skills than those who are not musically trained. With so many benefits, how can we most effectively engage our children in these activities? Children follow their parents. If your children see you enthusiastically practice an instrument (or learn for the first time), they will be very likely to follow. Similarly with sport and exercise, and even diet. 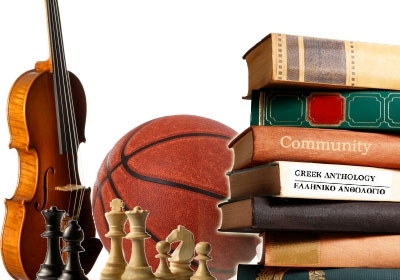 If we have sports-related items around the home, they're likely to be used! Same goes with a piano, keyboard, guitar, violin, or other instruments. Further to this idea, if we want them to be used, reduce other distractions, such as the TV, internet, Wii, and so on. A child will not practice the piano while the television is blaring, or siblings are playing games online. Look for opportunities for your child to extend herself. Ask about sports opportunities and teams at school. See if s/he would like to be involved in the after-school dance class or choir. Individual sports and music require more effort because of the lack of "team". Conversely, being part of a team seems to increase motivation as children enjoy being with their friends, and don't like to let them down. If friends are involved in a particular activity and your child shows an interest, the joint participation is likely to motivate them to stay involved. Extra-curricular tip #5: Be involved yourself! This provides an opportunity for parents to pass on positive attitudes about the activity. We get the chance to provide encouragement and feedback, pass on our feelings about the value of the activity, and teach important skills. And research shows that when we participate in an activity with our children they'll be more motivated to continue the activity even when we're not with them. One family had two daughters learning the piano. Their teacher demanded that a parent sit with the children and teach them as they practice. As a result, the children practiced effectively, and developed much faster than they would have with a disengaged or uninvolved parent. Their proficiency led to a powerful sense of accomplishment, and a thirst for more learning. An eleven year-old loved to ride his bike. His mother and father did too. They found that their daughter was more motivated to ride with them than alone. The family became involved in competitive cycling and all became more involved, motivated, fitter, and faster! The way we involve our children in music or sports matters. Just signing them up for a team, sport, or music practice may have a positive effect assuming our child can remain motivated. But by doing these five things, we're far more likely to see long-term motivation, participation, and success for our children in sport, music, and life. Server responsed at: 04/21/2019 10:51 a.m.